I have been thinking about how to quilt my Rainbow Scrap Challenge 2017 butterfly quilt. One idea involved my new Westalee rulers but I thought I should practice on something else to work out the bugs and gain some confidence before I commit to it. A spare butterfly block would be a perfect practice piece. Oh wait! I have one of those. 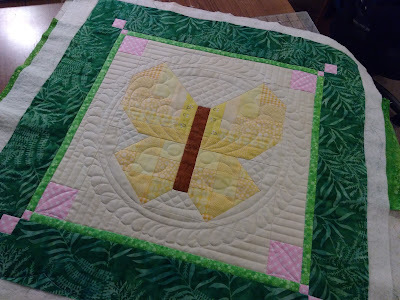 The first yellow butterfly block I made was much too light compared to the rest of the butterflies and I replaced it with a new block with more intense yellows. I added some borders to it and started playing. I have never ever quilted a piece this densely but it was a good opportunity to try various new-to-me quilting motifs so I just kept adding more quilting. The walking foot came out to stitch in the ditch around the butterfly and both sides of the narrow border. 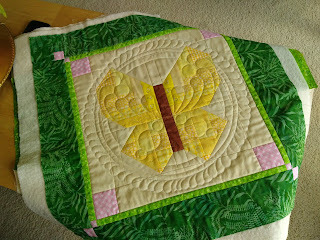 I used feather and circle templates/rulers for the quilting in the butterfly wings. I quilted the left wing first, then tried to quilt the mirror image in the right wings. Somehow, it was all offset about 1/4" but I kept working at it. I didn't remember until after I had finished my slightly offset right wing design that I was supposed to center the needle in the ruler foot. Sigh. Still, the overall look worked out pretty well and I don't think anyone but me will know it isn't quite as I intended. I switched back to the walking foot for the three concentric circles behind the butterfly. The circle sewing tool that came with my Sew Steady extension table makes these circles really easy on a small piece like this. That metal strip has two little prongs on the bottom that fit into a series of holes in the table, and a pin at the other end. You push the pin through the quilt from the bottom where you want the center of the circle to be. You adjust the radius of the circle by moving the pin closer or further away from your needle by setting the strip in different holes. When you start quilting (I used the walking foot) the quilt pivots at the pin as you quilt and you end up with a perfect circle. One of my two goals for this practice quilt was to quil feathers on a circle using the Westalee feather templates. I tried figuring it out on paper first, drawing the circle, then tracing the template and trying to figure out what ruler markings to line up where to space the feathers evenly and have them all lay at the same angle to the arc. No matter what I tried, the feathers ended up getting longer and skinnier as I went along the arc. I really didn't feel confident enough about all my pencil and paper attempts to try it on the quilt. So why are there feathers there after all? I really, really wanted feathers there, so I ditched the rulers, took a deep breath and freemotion stitched them freehand. I did it! I feathered! I used a lot of registration marks to help me judge the size and position of the individual lobes. You can see my little blue dots in the picture above. You can also see that they aren't quite as large as I had intended, falling shy of that outside dotted line, but since I consistently missed the mark, no one knows I missed now that the little blue dots have been erased. Hush!! Don't tell anyone. Next I tried out crosshatching with the straight edge and straight line markings on the 12" arc tool. That worked out very well, though it was a little tedious, even in the small spaces I filled between the butterfly and the inside of the circle. I really didn't feel like repeating it all around the feathered wreath as well, but I felt I needed to quilt something out there to even out the quilting density a little. How about vertical lines? By the time I had one corner stitched that way, I was bored, so switched the direction on the next corner, and again for each remaining corner. This is where the quilting ended today. It took me a while to figure out what to quilt in the green border. When I finally decided, I realized the only green thread I have is too old. It breaks at the slightest tug and broke when I tried to sew more than 3 stitches. It makes me sad. 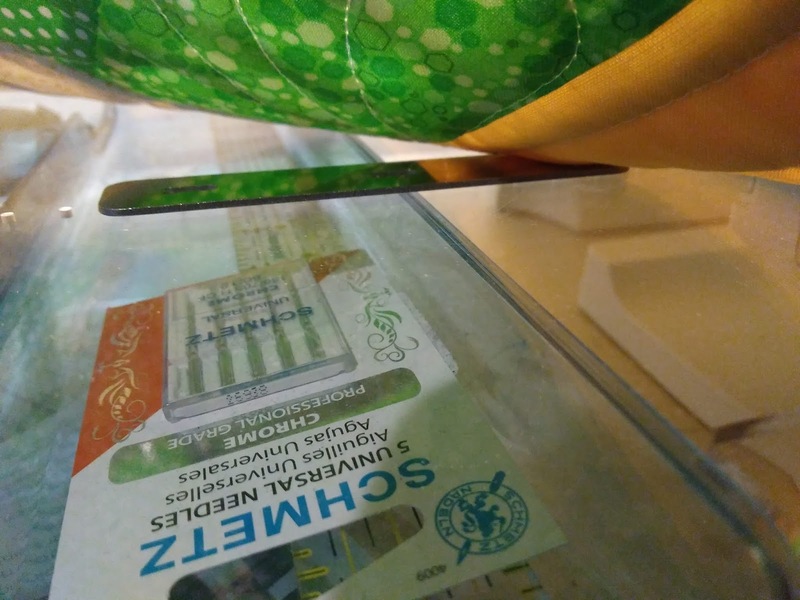 It was such a pretty green variegated thread, and half a spool of it is now useless. The second goal for this quilt is to try scalloping the border before I try that on the big butterfly quilt. The plan is to buy green thread tomorrow, quilt the border, take another deep breath and cut into the border. Bias binding will also be involved, but I have made that before (see tutorial here) so no worries on that front. Binding the curves and inside points will be a first for me though. Stay tuned! PS: The butterfly block tutorial is still available here if you'd like to make your own. 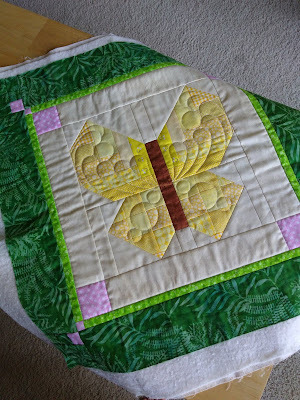 I love the quilting on the butterfly block, you did such a pretty job! 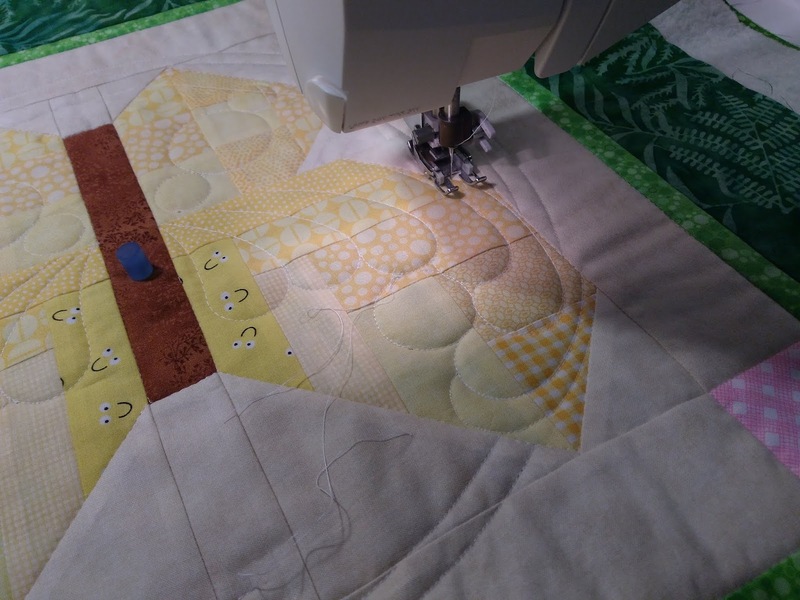 Your quilting on your butterfly is gorgeous. I use Westalee rulers but not the feather one, I always freehand them. I love how this looks. A heavily quilted practice piece is fun to do. I am amused that you are using the butterfly block to work out the bugs :-D In any case, your quilting is beautiful. I think the bugs are gone, only the beautiful butterfly remains. This is just utterly GORGEOUS Joanne! I have to look into these WEstalee circle templates; every since Judy (Quilt Paradigm) told me and showed me what she could do with them, I've wondered, but have never jumped in. I should YouTube some videos to wrap my brain around how they work. FMQ FEATHERS!! Yup I yelled that, way to go!!! They're lovely and frankly I don't see one imperfection in any place even though you 'fessed up on some...This on a whole quilt? Will be breathtaking. Oh, wow! I am so impressed! You did a beautiful job on this butterfly, and your feathers look wonderful! You must be very pleased with the results. I am interested to hear how the scallop binding goes. 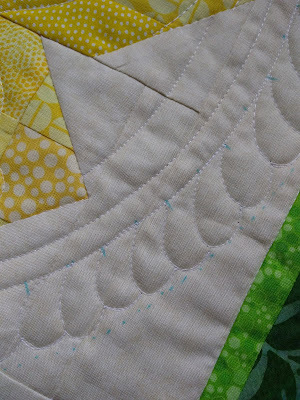 When I practice quilting, it is usually on old pices of fabrics and batting scraps. nothing that I can show afterward. I find it quite difficult to change from these practices samples to a big quilt. The quilt is so much harder to move. With the results you had for paractice, I am confident your quilt will be wonderful. This is just beautiful! I would love to learn to quilt more than just straight lines. I have purchased a ruler set, plus a ruler class through Craftsy. However, the Craftsy class is too time consuming. I would like to know just the basics and then do my own thing. Thanks for the tips! Oh, my goodness! It’s magnificent! Wow! That’s fantastic quilting. I dream of being able to freehand feathers. What a beautiful practice piece. I love how the quilting looks. Such a great idea to have a really good play with the reject/practise block. I think the final quilt will be amazing! That looks really beautiful. I'm intrigued by the circle thing. My son bought a Sew Steady table for me for Christmas, but I didn't have one of those with it. I will have to investigate!